Your Amazing Teen was one of my favorite projects as a content specialist for The Income Store, especially since I have a teenage daughter. 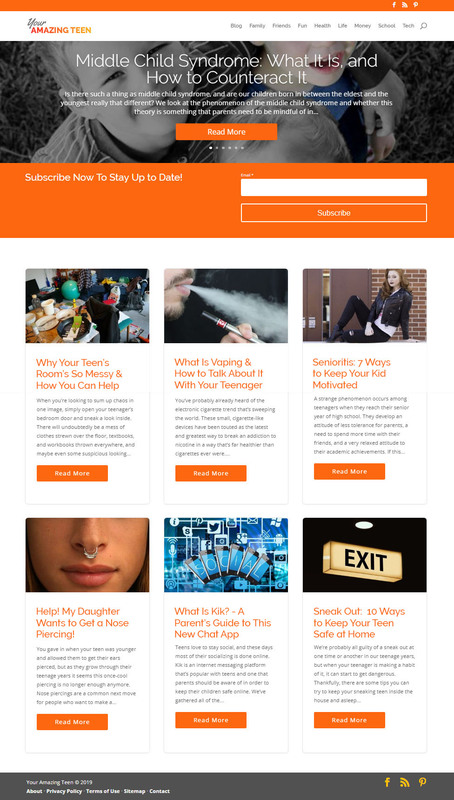 The site partner originally proposed a site called “Parenting, It’s a Trap.” The site’s proposed sections and articles focused the on negative aspects of parenting teenagers, like teen pregnancy, rule-breaking, and drug use. Our content director assigned this site to my team and then asked what I thought about it. With a bit of trepidation, as I was new, I told him the truth: That the name, sections, and subject matter came across as too negative. Parents want articles that address their concerns — and worst fears — in a way that’s positive, reassuring, and authoritative. Luckily for me, he agreed. I came up with a list of possible site names that had matching domains readily available. I also went on SEMrush and AHrefs to identify high traffic search terms with low competition scores, check backlinks, and see which related content is the most popular. I then created outlines for subtopics with latent semantical indexing (LSI) words and secondary keywords for long-tail searches and assigned articles to our writing team. In addition, the editors and I worked with the writers to devise short, attention-grabbing titles that would encourage shares, comments, and click-throughs on social media. Project Description: Generated list of possible site names with ownable domains (YourAmazingTeen.Com was the winner). Created site categories for navigation and content plan with 30 articles for site launch. Researched focus keyword phrases and LSI keywords. Produced outlines and clickable titles for the writing and editing team. Oversaw editing and optimizing for SEO and readability. Tracked and reported on status of content. Sections: Family, Friends, Fun, Health, Life, Money, School, Tech. You Know You’re Parenting a Teenager When… (Humor). A Guide to Planning the Best Family Vacation With Your Teens.